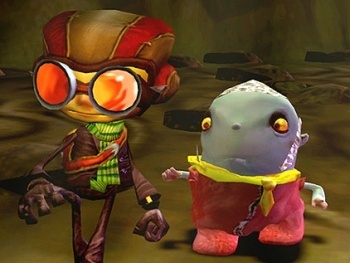 Despite what Tim Schafer would have you believe, Bobby Kotick likes videogames just fine. Double Fine founder Tim Schafer didn't mince words yesterday when talking about Activision Blizzard CEO Bobby Kotick, calling him a "total prick" who didn't like games and was bad for the industry. Unsurprisingly, these comments got plenty of attention, leading Activision to respond, and say that Schafer doesn't know what he's talking about. Maryanne Lataif, Senior VP of Corporate Communications at Activision Blizzard, says that Kotick - who Schafer has never met, she points out - does, and always has, liked playing games, but that being a CEO takes up a lot of time. "Tim Schafer's comment that Bobby Kotick 'makes a big deal about not liking games' just isn't true. Bobby has always been passionate about games, and loves the video game industry," she said. "But as CEO of a company that makes games enjoyed by millions of people worldwide, the demands on his time now make it difficult to play games as often as he'd like to or as much as he once did." The statement makes a lot of sense; being a CEO is an immense responsibility, and that responsibility only increased with the Activision/Vivendi merger. Like it or not, the games themselves are just one aspect of Kotick's job, and are mixed in with every other aspect of running a massive multi-national corporation. Maybe it's unreasonable to expect Kotick to be able to think of them at anything other than a strategic level right now.